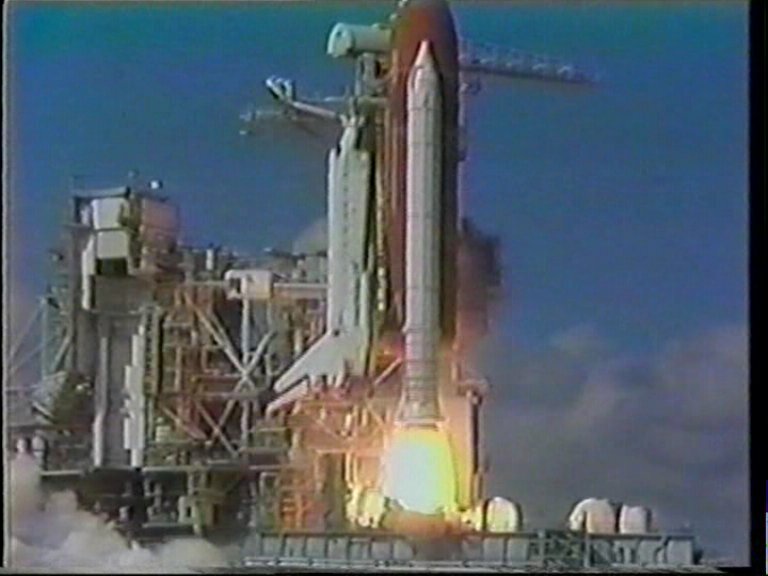 On September 12th, 1991, the shuttle mission designated STS-48 blasted off from Pad 39-A at the Kennedy Space Center in Florida. Aboard the Discovery were astronauts John O. Creighton, Kenneth S. Reightler, Jr., James F. Buchli, Charles D. Gemar and Mark N. Brown. Their primary mission was to launch a seven-ton observatory, called the Upper Atmosphere Research Satellite (UARS), into a low Earth orbit. The mission, however, became more famous for quite another thing. On September 15sup>th, 1991, a camera at the rear of the shuttle’s payload bay captured something extraordinary. Focused on the distant, curving horizon, over Australia, a violent thunderstorm raged three hundred miles below Discovery. Between the Earth and the shuttle, several objects were moving in seemingly random paths. All of a sudden, another object appeared from over the horizon and began moving to the left of the camera’s field of view. Suddenly there was a bright flash from the far left and the new object streaked away it the depths of space. Several, but not all, of the other objects also altered their courses. A second later, two streaks flashed through the frame, one of which passed close to where the new object had been. NASA’s explanation was that the objects were nothing more than ice particles and their sudden motion was caused by the source of the flash, Discovery’s manoeuvring thrusters. This explanation did not sit well with many researchers, though, and one, Dr Jack Kasher, a physicist from the University of Nebraska and in the employ of NASA also, set about to test the ice particle theory. His method was to try and prove that the objects were indeed nothing more astounding than the chunks of ice that follow all space flights, but what his analysis proved to him was much more fascinating and not a little disturbing. Dr Kasher enlisted the help of the microbiology department of the University of Wisconsin in Milwaukee. They had developed software that enabled them to plot the trajectories of tiny microbes in Lake Michigan. This software would be ideally suited to obtaining accurate data on the objects seen in the STS-48 footage. Dr Kasher also found equations to work out the 3-dimensional geometry of the footage i.e. taking the 2-dimensional image from the television screen and calculating the 3-dimensional movements of the objects depicted – basically adding the z coordinates to the existing x and y. Armed with graphs and charts from the guys in Milwaukee, Kasher set about trying to prove the ice particle theory. NASA explained the objects as being ice particles caught in the exhaust from the shuttle’s Reaction Control System (RCS) thrusters. Kasher had to find out which of the thrusters had fired. Each orbiter has 44 thrusters (38 primary and 6 vernier). As the flash came from the left of the camera, it must have come from one of the aft clusters, so the 16 thrusters at the forward section of Discovery can instantly be dismissed. The camera is mounted at the back of the payload bay on the right-hand side, so it is unlikely that the thrusters on that side, behind the camera would be seen, so this eliminates another 14 thrusters. So, what we have remaining are the 14 thrusters in the left-hand Orbital Manoeuvring System/Reaction Control System (OMS/RCS) pod. The OMS engines are used for orbital insertion, orbital transfer and de-orbit functions, amongst others. Basically, they move the shuttle in space and are the largest, most powerful engines after the main ones. The main RCS engines are used to change the attitude of the shuttle both in orbit and in the atmosphere. They control the yaw, pitch and roll functions, as well as small velocity changes along the orbiter’s axis that may be required. 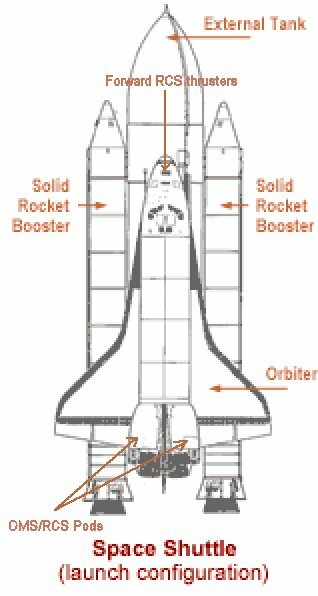 The vernier engines are much less powerful and are normally used for stabilising the shuttle in orbit or for station-keeping. The upshot is that if any of the main thrusters were the cause of the flash on the screen, then the angle of the horizon should have changed as the orbiter moved in space. It didn’t, the distant horizon remained fixed. 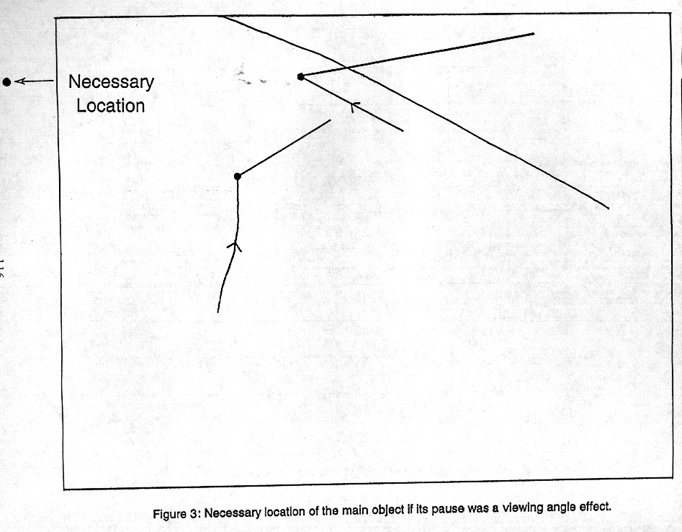 Dr Kasher calculated that if any of the relevant thrusters had fired, the picture should have rotated about 6 degrees, a motion that should clearly have been visible. 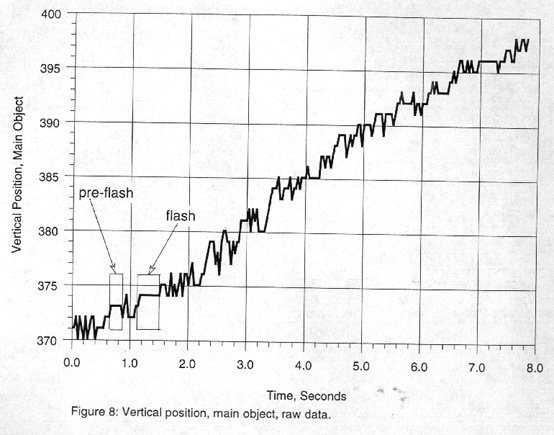 Let us assume, then, that the flash was caused by the vernier RCS firing. Remember, the camera is located at the rear of the payload bay on the right hand (starboard) side. It is looking across the left (port) side of the shuttle and up at an angle of roughly 50-70 degrees from the main body of the shuttle. The camera is focused to infinity, so we can see the horizon clearly. 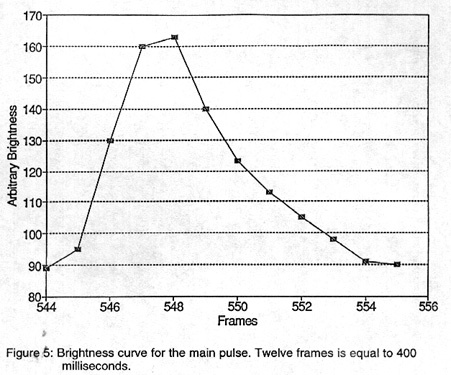 It should also be noted that the flash in the footage lasted for almost 0.4 seconds. 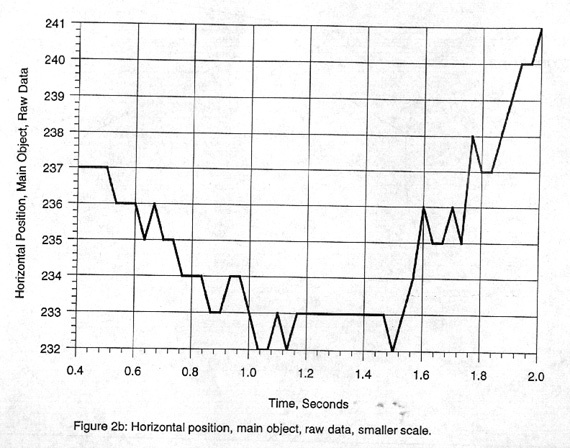 So neither the steady-state thrust (1-125 seconds) or the pulse-mode thrust (0.08 seconds) match that timeframe. James Oberg countered this by suggesting that the camera only picked up part of the thrusting manoeuvre, so we only saw the back end of it, so to speak. 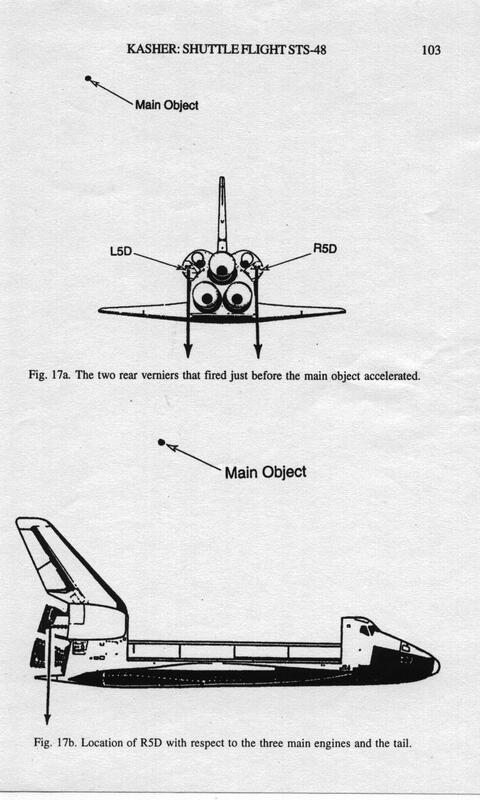 In an article that Dr Kasher published in the Journal of UFO Studies, he had managed to get hold of the telemetry data from STS-48 and found that the only thrusters that fired at that time were the two downward-pointing verniers on the left and right-hand sides of the shuttle (L5D and R5D – Left and Right thrusters 5, firing Downwards). Obviously the thrust from the starboard thrusters could not possibly reach the ‘ice particle’, so we are left with the portside vernier. In his article, the only way in which Dr Kasher could accept that the thrust from L5D could possibly interact with the main object was if somehow the gases ‘bounced’ off the left wing of the shuttle! If this occurred, though, it would go against the design requirements of the spacecraft, making the thrusters less effective. In the fifteen minutes preceding the ‘flashes’, the vernier thrusters fired nineteen times. Dr Kasher finds it odd that none of these other thrusters exhausts produced a ‘flash’. 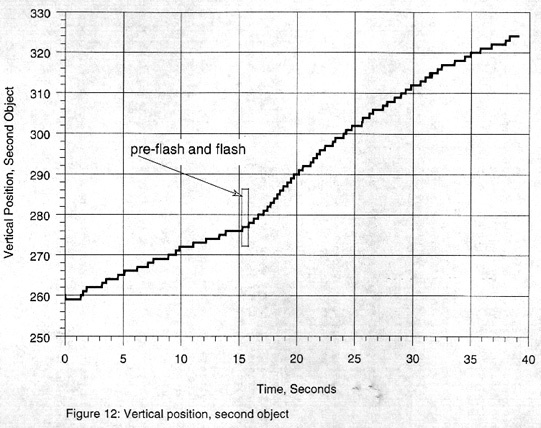 The main object in the film, the one that streaks away after the flash, was found to actually stop dead in its tracks for a full half-second. 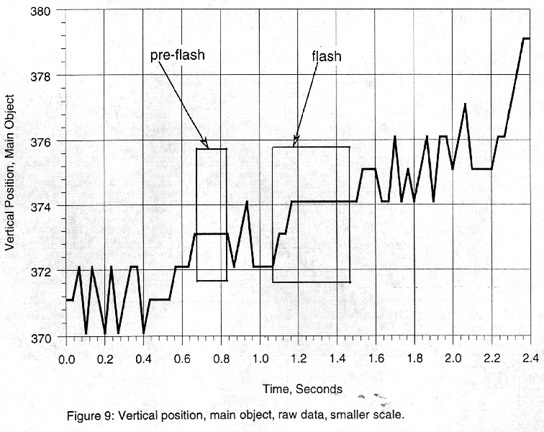 Kasher’s analysis of the flash found that there were actually two flashes, a short pre-flash and the main one. 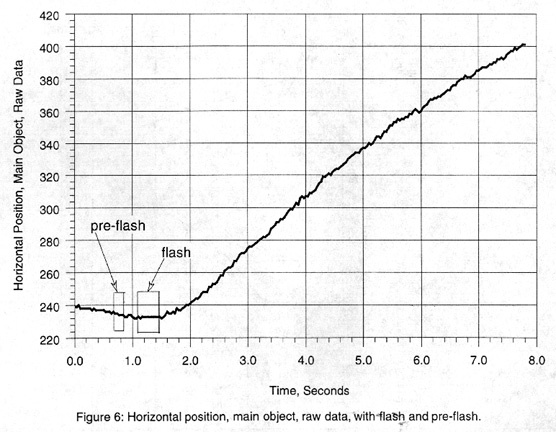 It could be argued that the pre-flash was the one that stopped the object dead and the main flash was what caused it to shoot away. Unfortunately for that theory, Dr Kasher calculated that the object was actually moving away from the shuttle at the time of the pre-flash. For anything to stop it in space, it would have had to come from the opposite side i.e. 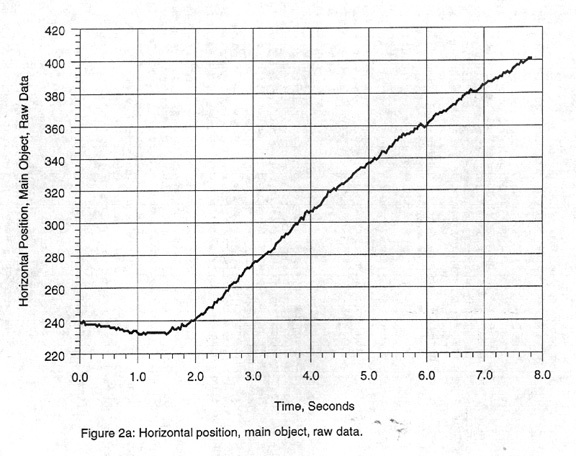 the exact opposite direction in which the vernier fired! Obviously this is impossible, unless the object was some sort of controlled craft and stopped under its own power. 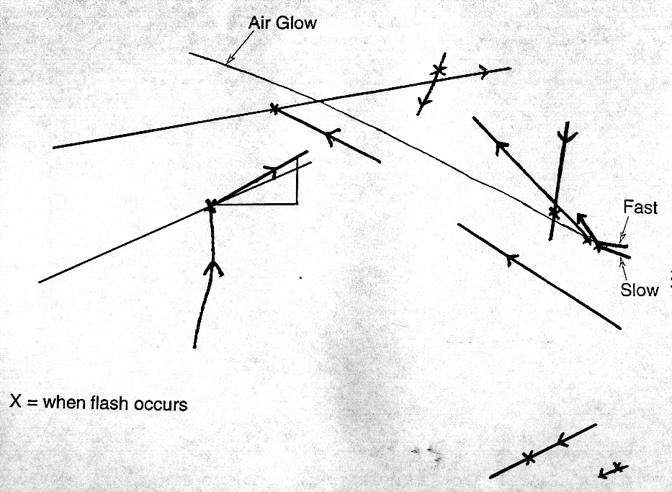 Using the trajectories of the two main objects, Kasher was able to discount that it was the RCS thrusters that caused them to move. He found that, drawing lines back from their trajectories after the flash, they did not converge on where the thrusters should have been. In fact, they diverged, never meeting at all! 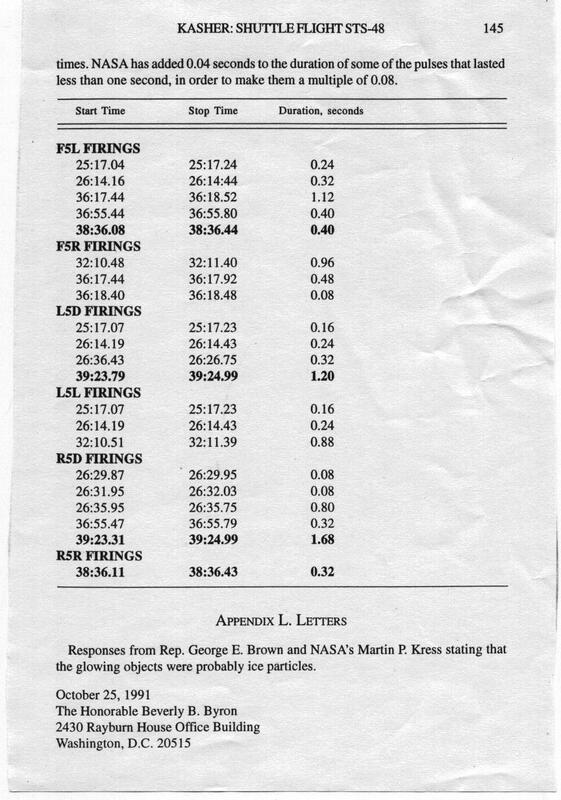 Next, Kasher worked out (still assuming these were ice particles, remember) the actual velocities of the objects in the film, compared with what their speeds should have been if they were influenced by the thruster’s exhaust. His calculations showed that the main object was accelerating away for 1.7 seconds at about 5-6 feet per second, while the exhaust pulse lasted for 0.4 seconds with a velocity of about 8,400 feet per second. This causes a slight problem, because the equations show that the object, if it is an ice particle, should be travelling at 98% of the exhaust velocity of the vernier thruster, which would give it a speed of about 8,300 feet per second. A slight difference! 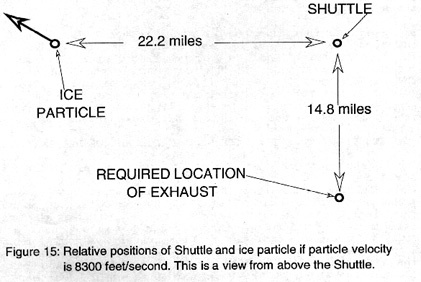 Also, the object, if an ice particle, should be about 65 feet from the shuttle. It reacts half a second after the main flash. 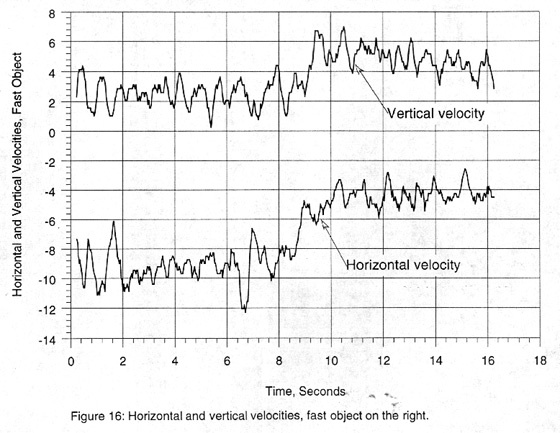 This means that the exhaust velocity should be about 130 feet per second. As we have seen, the velocity of the gases from the vernier rockets are in the order of 8,400 feet per second, so this is another example of how the object cannot be an ice particle close to Discovery. Now, as we know the exhaust velocity of the vernier thrusters, we can work out how far the ‘ice particle’ would have to be from the shuttle if it took half a second to react to the flash. It turns out that it would have to be 22.2 miles from Discovery! Also, drawing a line back through the trajectory of the object places the thrusters 14.8 miles behind the shuttle. It could be argued that the shuttle is zipping through space and covers 14.8 miles quickly. At an altitude of 354 miles, the shuttle is travelling at 4.7 miles per second, so it would take over three seconds to travel 14.8 miles, not the half-second required to make the numbers fit. 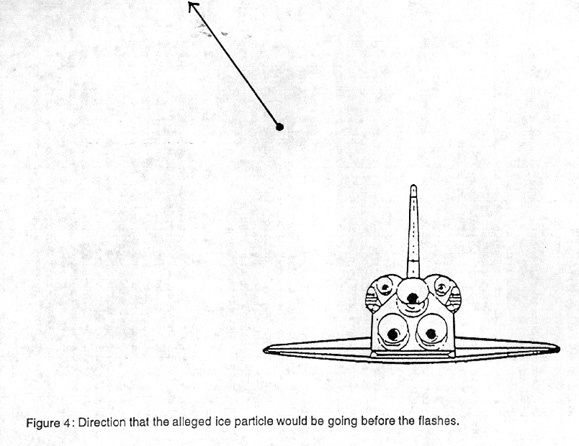 Also, it is unlikely that an ice particle small enough to be affected by the vernier rocket would even be visible to the camera from 22 miles away. So, from Dr Kasher’s analysis, he cannot conceivably conclude that what we are seeing in the footage are ice particles close to the camera. His calculations seem to suggest that what we have are large objects, manoeuvring above the Earth’s atmosphere under their own power. 1 mile distance means the object moved away at 10.5 Gs with a velocity of 250 mph. 10 mile distance means the object moved away at 105 Gs with a velocity of 2,500 mph. 100 mile distance means the object moved away at 1050 Gs with a velocity of 25,000 mph. 1000 mile distance means the object moved away at 10,500 Gs with a velocity of 250,000 mph. 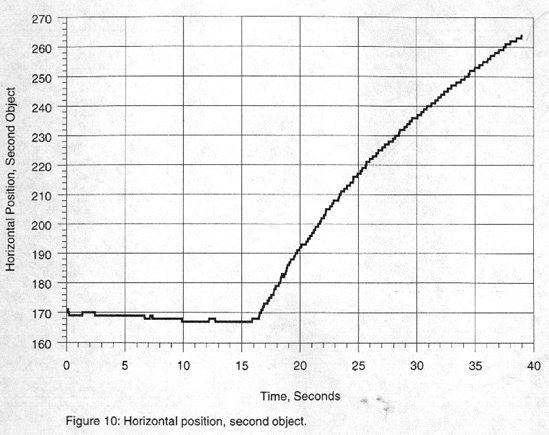 1,710 mile distance (the horizon) means the object moved away at 18,000 Gs with a velocity of 430,000 mph. Obviously these are forces that would crush any human pilot, were any present. 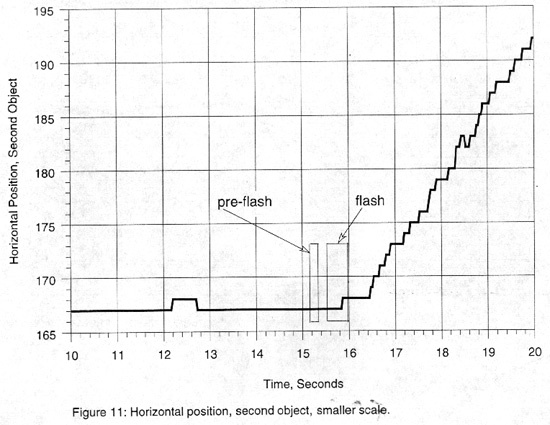 If the flash is not from the RCS rocket, then what causes it? 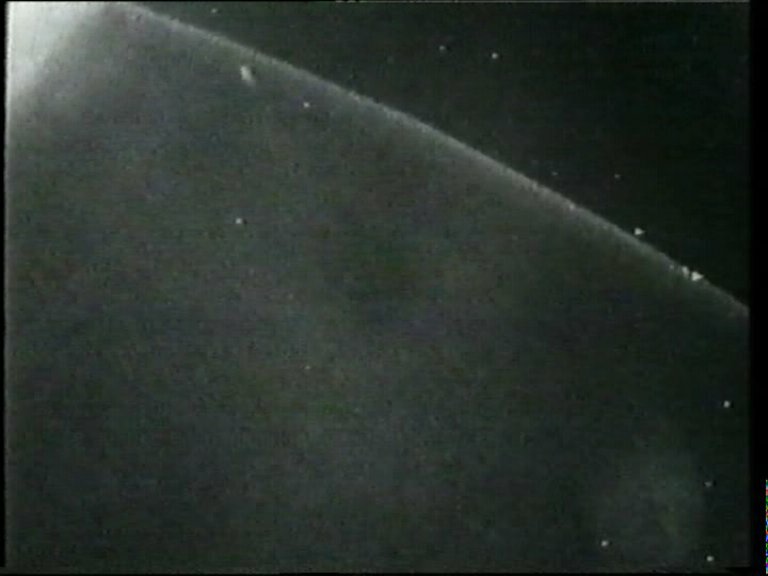 Another strange aspect to the STS-48 footage are two streaks that zip away into space, one of them passing through the area the main object had been before the flash. What were they? It has been suggested that the streaks were actually missiles fired from the Earth! If so, then they are extremely fast-moving missiles. A projectile from a rail gun or coil gun or a beam from a projected energy weapon has also been proposed. Was the flash from some kind of targeting system? If the streaks were not just more bits of ice passing through the frame, then it poses a difficult question. Why are we shooting at stuff in orbit? The objects easily out-manoeuvred our attempts, but it is still a scary thought. There were other objects caught by the camera that were also affected by the flash. 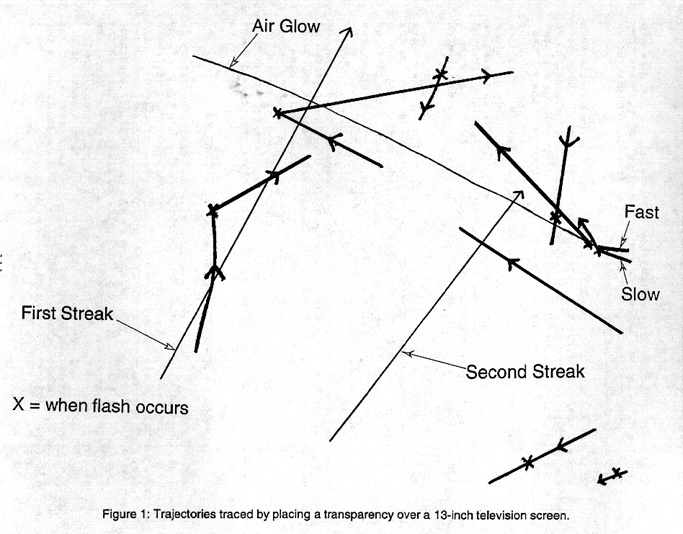 On the right side of the screen, several objects, with what appeared to be flashing lights, slightly altered their trajectories after the flash. Other objects, though, seemed unaffected. Afterwards, the camera pans down and we see a strange, triangular object for a brief period before it is swallowed by the reflected glare from the rising sun. Then we see the payload bay of the shuttle grossly out of focus. The camera adjusts and we then see it clearly, proving that the camera focus was previously set to infinity. The STS-48 footage has become the stuff of legend in the UFO community and, despite their best efforts, NASA seems unable to explain it, sticking steadfastly to the ice particle theory. Jack Kasher’s calculations seem to prove that they are not so. Other researchers, such as Mark Carlotto, have also independently come to the conclusion that these are not chunks of ice close to Discovery. Is this definite proof that we are not only ‘not alone’, but that we are also in conflict with somebody from beyond our planet? Dr Kasher, thank you from everybody at UFO DATA Magazine for agreeing to speak with us. Anybody with an interest in UFOs will know of your research into the famous STS-48 footage, but not everybody will know that you were working for the National Aeronautics and Space Administration at the time. Are you still doing research for NASA and if so, what are you working on these days? 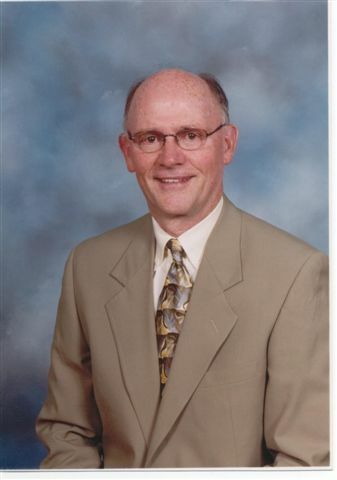 I began my research for NASA in the summer of 1992, studying supergranules on the surface of the Sun, and continued working for them off and on until I retired in 2001 from the University of Nebraska at Omaha after 33 years there. I have not done anything for them since then. Are you also still active within the Mutual UFO Network (MUFON)? I am currently a member of MUFON, and serve as a consultant in physics, Nebraska State Director, and Central Regional Director over 20 states in the middle of the USA. In my capacity as consultant in physics I have most recently helped analyze several pages of physics equations written by Stan Romanek both after a hypnotic session and during the night while he was asleep. Most of the equations are very advanced, and deal with quantum gravity. They are way beyond anything Mr. Romanek is capable of by himself. As Nebraska State Director I help organize and run our bi-monthly meetings, assign cases for investigation, and give UFO talks locally when asked. As Central Regional Director I communicate with the State Directors in my region, and offer assistance in any way that might be helpful. In the last few years, ufology has been said to be in something of a decline. Do you agree with this or are you of the opinion that UFO sightings are actually on the increase? My general sense is that UFO sightings are at least steady, if not increasing. I know that here in Nebraska we are getting more reports now than in the recent past. And the sightings down in Mexico, and the crop circles in England, continue on as well. I haven’t made a quantitative study of the issue, though; so I can only give you my impressions, which are not based on counting the number of sightings worldwide. Going back to the STS-48 footage, your analysis has become a benchmark for the study of this particular case. Do you stand by your findings, that what appears in the film are controlled spacecraft, or do the arguments from NASA, that they are ice particles agitated by Discovery’s thrusters, now seem more likely? I have not changed my opinion about the STS-48 footage. I still think that the objects in the video were not ice particles, but rather spacecraft out in space away from the Shuttle, exhibiting flight characteristics well beyond anything we are capable of here on the Earth. 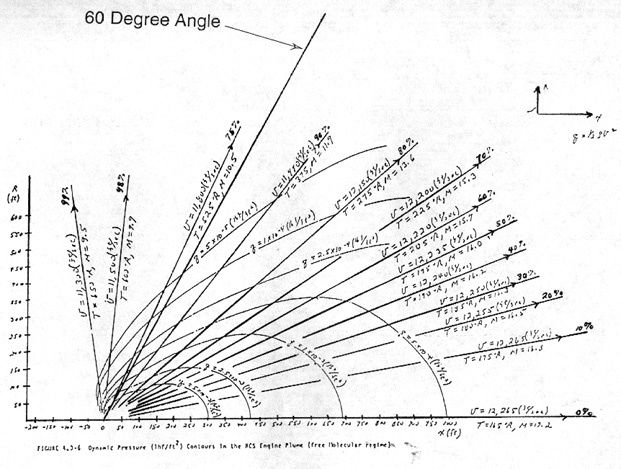 In your analysis of the STS-48 objects, you implemented some equations that gave you the trajectories, velocities etc. of the objects based on their motion in the film. Some sceptics, such as James Oberg, have suggested that your figures are wrong. Do you still stand by them and have any of the debunkers come up with alternative figures? To the best of my knowledge no one, including James Oberg, has come up with a detailed, rigorous, scientific analysis proving that my calculations and figures are wrong. Debunkers MUST do this, if they wish to defend the ice particle theory. Since they have not presented this analysis, and since more than ten years have passed since I published my calculations, I assume that no one can show that I am wrong. I wholeheartedly stand by my calculations and figures. To prove the objects were ice particles, it is not enough to simply watch the video and make a qualitative judgment. A rigorous quantitative analysis is needed. There is another aspect of the video that has been somewhat overlooked. After the main flash, and immediately after the bright objects move in apparent reaction to the flash, two streaks move in straight lines up from the lower left of the picture into the regions where the objects had been. One of these streaks moves through the previous location of the main object, and the other goes through the right side of the picture, where two other objects had been. These two streaks are clearly of a different texture and appearance than the glowing objects of interest. They have a fuzzier appearance, move in straight lines, and their trajectories can be traced back to a common point that is below the lower part of the screen. No one from NASA has commented on or tried to explain the different appearance of these two streaks, which are obviously very strange ice particles, if that is what they think they are. In addition, the timing of the two streaks is very coincidental, if they are ice particles. 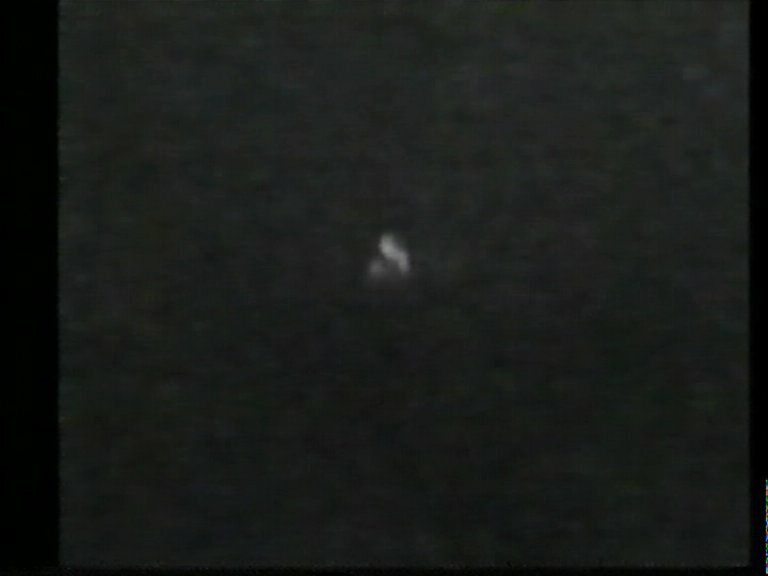 There has been a multitude of other NASA footage showing anomalous objects, possibly the most widely known being the ‘tether’ footage from STS-75. What are your thoughts on some of this other evidence? I have always had a problem believing the tether footage from STS-75 shows some anomalous event. The tether itself is about 13 miles long and less than a centimeter thick. In the footage the thickness of the tether is way, way out of proportion to its length. This suggests to me some distortion in the picture caused by a camera effect. Until this can be clearly explained, I will find it difficult to interpret the tether footage in terms of something extraterrestrial. The best analysis I have seen is by James Oberg, at http://www.rense.com/general/stsd.htm. Another Shuttle flight I find very interesting is STS-80. There were several unusual objects moving in very strange ways. The cameraman obviously noticed them, because in one instance he zoomed in on three objects as they moved fairly evenly around the right side of the Earth. I can’t say what the objects were. It would be nice if someone at NASA had tried to explain them for us. Have any NASA astronauts commented to you about STS-48, STS-75 or any other UFO footage? What is the feeling amongst them about UFOs in general? No astronauts have ever contacted me or commented to me about my analysis of the STS-48 footage or their belief in UFOs. However, Gordon Cooper has very clearly and publicly commented on his experiences, especially the case when a saucer landed on the runway at Edwards Air Force base in California when he was stationed there in the 1960s. Anyone wishing more details about Cooper’s experiences can find them in his book, Leap of Faith. Edwin ‘Buzz’ Aldrin recently stated in the television documentary, Apollo 11: The Untold Story, that on their way to the Moon in 1969, Armstrong, Collins and himself saw an unidentified object travelling alongside their craft. I mean, if it wasn’t a section of their own launch vehicle, then what could it have been? Something from the earlier Apollo missions, prior to the landing, perhaps? He also claimed that NASA ordered the men not to discuss the incident afterwards. What impact do you think this disclosure will have and do you believe it is a part of the overall disclosure program to drip-feed the public into the reality of the UFO/alien visitation subject? I didn’t see the documentary, so I can’t comment from first hand knowledge. But if they saw something on the way to the Moon, before they got there, then it is very, very unlikely that it was something from the earlier Apollo missions. It would have to be trapped in orbit, and there wouldn’t be an orbit at that location. Also, you would think that the astronauts would recognize something from their own launch vehicle. So it is difficult to say what it was that they saw. It is also very interesting that NASA told them not to discuss the incident. My opinion about an overall disclosure program by NASA is purely speculation; but I strongly doubt that NASA is doing this. Like most of us in the UFO field, I am aware of this interesting rumor. I find it quite fascinating, and would love for it to be true. But I don’t think we’ll ever have the evidence to prove it. It would take a major press conference by all the astronauts involved, and I don’t think that will happen. Since STS-48, has anything from NASA relating to UFOs piqued your interest that the general public might not be aware of? I have no secret files or confidential cases to disclose. Those I find most interesting, like the STS-75 and STS-80 footages mentioned above, are known to the general public. Recently, the British Ministry of Defence (MoD) released a document to the public that suggested that most UFOs, those that could not be explained as terrestrial technology, were weird atmospheric phenomena such as plasmas. Have you had the chance to examine the report and, if so, what do you think of its conclusions? I have not read the report first hand, and have only seen summaries of it. But it appears to me to be far-fetched to try to explain most UFOs as atmospheric phenomena. I wonder how many of the more than 3,000 trace cases studied by Ted Phillips were included in their report. I would guess none, since these cases would simply blow their conclusion out of the water. 2007 is likely to be a big year for ufology, being the sixtieth anniversary of the Roswell Incident. No doubt the mainstream media will latch onto it and we will be inundated with UFO-based programming for a while, probably some good, but more likely, mostly bad. What do you think of the way the mainstream media handles the UFO subject? For instance, the current series of The History Channel, UFO Files, is an excellent example, in my opinion, of good, mainstream UFO programming. At the other end of the spectrum, here in the UK, we suffered The World’s Strangest UFO Stories on Discovery, which handled the subject with a great deal of ridicule. I would give the mainstream media mixed reviews for their coverage of UFO issues. I was disappointed with the Peter Jennings report last year on ABC; and the major networks at least part of the time seem to lean too much toward scepticism. But, as you point out, The History Channel has produced a good number of fine, objective programs recently. When I watch one I always look forward to a solid, fair treatment of whatever issue they are presenting. I hope this trend continues throughout 2007. What are your plans for the future and how do you see ufology progressing in the years to come? Do you think we will ever get definitive answers or is the UFO enigma going to remain just that, an enigma? I plan to continue working for MUFON in the three capacities mentioned above, especially applying my knowledge of physics when I can. As far as the future of ufology is concerned, we can always hope that the big breakthrough is just around the corner. But I recall a comment made by Dr. Leo Sprinkle at a presentation of his I attended some years ago. Someone asked if he thought we would have these definitive answers very soon, and he replied (I’m paraphrasing him) “Yes, I certainly do, very soon. I thought that in the 1960s, and in the 1970s, and in the 1980s, and in the 1990s.” In other words, we always appear to be on the brink of the big discovery, but never quite seem to get there. But it’s fun to keep trying. Thank you for taking time out of your busy schedule to speak with us, Dr Kasher. Everybody at UFO DATA Magazine wishes you all the best for the future.